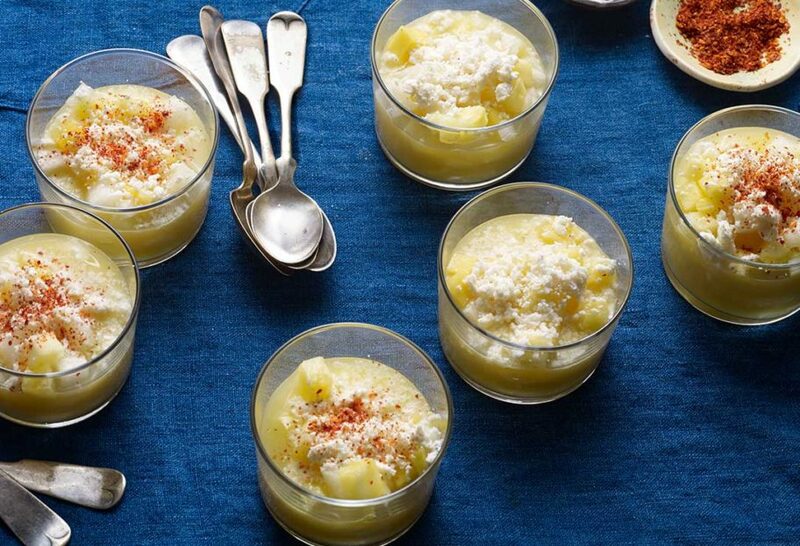 To make individual gazpachos: In a cup, add a layer of mango, pineapple, jícama, a tablespoon of onion, a tablespoon of queso; then another layer of mango, pineapple, jícama, and another tablespoon of queso. Pour in 1/2 cup orange juice, a tablespoon of lime juice, and sprinkle salt and ground chile to taste. Repeat to make 6 individual cups. To make for all: Mix all the ingredients in a large mixing bowl to your taste! Hi Pati: I made this recipe for Gazpacho and it was absolutely delicious. I served a bottle of Mezcal (from Oaxaca of course) on the side so that the adults could spike it up a touch along with extra Valentina hot sauce. Super, super, super yummy. It was a big hit. As always, thanks for sharing Pati. Buen provecho. FUERZA MEXICO!!!!! Thank you for sharing your recipes. I am looking forward to making the Gazpacho Moreliano as soon as I can get to a real market for ingredients. Due to allergies, I was stuck inside this weekend but enjoyed watching the “Pati-thon” on TV (made me hungry). It is always a joy to watch your shows and makes me want to visit Mexico again. One question, what is the difference between cotija and fresco? Just wondering which one will bring out the best flavors for this recipe? Thank you again for sharing your family and your recipes, may God continue to bless you. I am your loyal fan I made this wonderful Morelia fruit salad just before Cinco de Mayo it was delicious A few days later I made a pizza; very thin crust and used your salsa Verde Cruda as the sauce then layered it with caso fresco, Parmesan,mozzarella and put chunks of salami and topped it off with some of the fruit from the Morelia salad with a lot of garlic and it made the most delicious pizza thanks to your recipes. I do so enjoy watching your program I love your recipes so much I have collected most of your recipes Thank you so much for sharing all of your favorite foods and recipes with us. Oh yum…your pizza sounds delicious, Margie. I teach foods courses in high school in North Carolina. My advanced students make this in lab every semester as a part of our study of fruits, and they love it. Some just eat it as a “fruit cup”, as one student called it, but some go all out and try it with the onions, queso fresco and hot sauce. I had a hard time sourcing the peppers it calls for, so we used Tajin – it was really good. Thanks for the recipe and the insight into an authentic and unusual Mexican preparation. By the way, my kids love your enthusiasm in the video, and they were awed by the gazpacho vendors’ amazing knife skills. Oh that is so awesome that you make the fruit salad with your students! Please say hola to your whole class for me! So delicious 😋. I’ve made this twice for family and friends. We love the unique and fresh taste. Donna, thank you so much. I’m so glad your family and friends have enjoyed it. I hope you had a fun party, Raul, and that everyone enjoyed the fruit salad! I was enthralled with the sounds and sights in this episode. I want to make “golden gazpacho” for a small plates tasting in preparation for an upcoming summer solstice fundraiser for our Nature center. Good luck with the fundraiser Rose! Definitely going to try this. Maybe next month for our church International Dinner. This is absolutely delicious! Thank you for sharing your bright personality and amazing recipes. I missed your show for March 11, 2015 and wouls like to know about the recipes I missed. Thank you & keep on cooking!! HOLA HUERITA!!!! ME ENCANTA SU PROGRAMA Y YA HICE ALGUNAS DE SUS RECETAS Y ESTAN DELICIOSAS GRACIAS Y QUE DIOS LA BENDIGA!!!:=].. I miss my mother’s south of the border cooking, and being a single male parent, I had to learn how to cook…so, I watch your show often and surprise my children and grandchildren with my excellent dishes from Mexico. Thanks,C.L. Hola C.L., Thank you for writing!! I’m sooo happy you are sharing the tradition of your mom’s cooking with your kids & grandkids! When I saw your show with this and your enthusiasm was intoxicating when you explained the flavors I knew I had to try it! I took it to the family reunion and everyone loved it, I sent home some of it home with my 85-year-old uncle he just loved it. Hi Karla, So happy to hear everyone liked the gazpacho! Thank you for making it!! It said you could not get the May recipes until June. Really enjoy your personality and how excited you are to share your food. We are like that in New Orleans as well. Your cookbook is a pleasure to use, and I am making the Gazapacho Salad for my wife tomorrow because I know she will love it. As Jacque says “Keep Cooking”. I made this but couldn’t find jicama so I used not so ripe pear and it was soooo good I could eat the whole big bowl MMMMMM good thank for all the wonderful recipes you share. Thank you!! Good to know it works with pear too! Would this be considered heart healthy? My wife made this Gazpacho and my entire family (even my Dad!) LOVED IT!!! Thank you for sharing such a great recipe and introducing us to a new and wonderful flavor combination. This was the first time I watched your show, the gazpacho looked so wonderful! Unfortunately I am severely allergic to mangos 🙁 Do you have any suggestions for a substitute for the mango? I would love to make this for an event I have next week. You can really use any fruit of your liking! But what would substitute mangoes best, is another fruit that is sweet at the same as tart. Do you like plums? apricots? even apples! Anything goes! Tried the Gazpacho in Morelia at the place you fllmed at. Delicious. Also tried carnitas in Patzcuaro at a restaurant on the way out of town. I was game but our guide did not want to eat at the street vendors. Terrific. Can’t wait to relive our Colonial Mexico tour through your recipes. Love your recipes. Am going to make this gazpacho this weekend. Am saving the grilled pineapple margarita for a Christmas dinner with the family signature drink, I know they’ll love it. You are a wonderful cook, love your recipes. Thank You Pati! God Bless.